As this year’s Masters Tournament approaches, we’re eager to see who among the 91 contestants will prove he deserves the coveted green jacket. 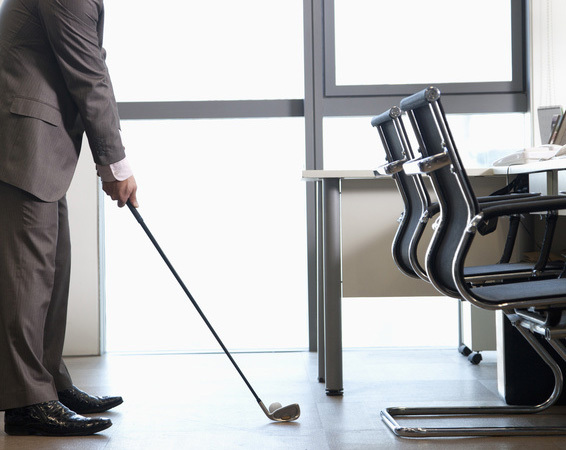 Whether you’re a scratch player or high handicap hack, you can take these tips from the course to the office. The essence of a quality golf game is adhering to sound fundamentals. Before you can even swing at a ball, you’d better master your posture, stance, balance, and grip. If any of these basic skills aren’t right, the end result of the shot could leave you with less than you desire. If you want to hit a good shot in golf, you’d better know your fundamentals. The responsibilities and expenses of owning and running a business mean it’s even more important to establish your basics. Golf Digest Teaching Professional Jim Flick says you’ll hit better shots with more consistency when you focus on perfecting your rhythm. An established rhythm can also help your ability to respond to changing conditions of the environment, including wind, temperature, and distance to the target, ultimately allowing you to play to your potential. Our businesses aren’t much different. To be successful, we’ve got to continually perfect our business rhythm to the changing economic environment. Once we’ve mastered the order in which the parts of our businesses move, our decisions will result in successful momentum that can power through changes in staffing, market fluctuations, and supply and demand. Planning production in defined increments of time to reach established goals. In other words, you and your staff need to create a clear idea of exactly what you can expect to achieve from your work day, week, month, and year. Knowing where to save and where to invest to maximize output. Perhaps you and your staff are putting too much time into tedious administrative tasks—tasks that are taking away from time you could spend on doing what you’re good at. Letting an expert handle those (so you can be an expert at what you do) doesn’t mean you give up control; it means you realize that investing a small amount to have someone partner with you to build your business is worth more than the initial cost. For instance, if you feel like you’re spending time you don’t really have to find out if your advertising efforts are making a difference at all, you need a partner who can help you strategize for better results. Creating a winning team. Unlike golf, a successful business rarely operates with one player. A winning team comes from hiring the right people and continually providing opportunities for the whole team to do better. In golf, you’ll almost always leave the course satisfied when you plan well, adhere to fundamentals, give outstanding effort, and enjoy the game. A good day in the office works that way, too—for the most part. Of course, as anyone who’s played more than a few rounds or worked longer than a few weeks can tell you, there’s always going to be an off day. Greg Norman’s 20 minute, final-round meltdown at Augusta cost him a green-jacket-ceremony in 1996. There’s no telling what a bad 20 minutes with a customer could cost your business. For that reason, it’s imperative to have a monitor for your sales success rates. Unlike Norman, you’ll get a second chance, and your business won’t shutter because of a bad round. “A Tradition Unlike Any Other” speaks for itself. From the minute you arrive on the hallowed grounds in Augusta, it’s clear you’re experiencing the very best there is in the game of golf. The Masters is the standard to which every golfing event is measured and what every tournament aspires to become. It’s in such high demand that tickets are sold out despite their cost. The best businesses operate in the same way, even down to price: 55% of customers say they’d pay extra to guarantee better service. Being the best matters, and exceptional companies take that to heart—every customer experience is “a tradition unlike any other.” They understand what excellence looks like, and work to achieve it in every detail. Becoming the standard for exceptional customer experience lets others view you as the best. If green-jacket-worthy service is your number one goal, let’s talk! We’d love to help you on your journey to excellence.